When we originally bought our Ridgeback World Panorama bikes (http://www.ridgeback.co.uk/bike/panorama), we ordered online a couple of kickstands to fit to each bike. However, when they arrived and we offered them up to the bikes, we realised there was not enough room to fit them due to the gear cabling running underneath the bike. Also, we found out that fitting these clamp-type stands to the frame voids the manufacturer’s warranty because of the possibility of over-tightening and crushing the frame tubing. This left us with a bit of a dilemma: how could we fit a stand to our bikes? After a lot of searching on the Internet, I alighted upon a website in the USA where a guy manufactures ‘click-stands’ (http://www.click-stand.com) – the ideal answer to our problem. This is a simple but effective idea – a lightweight (approx. 75 g) pole made from expedition/aircraft grade 7000 series aluminum tubing that can be folded (not unlike a tent pole). It can fold down to between 7 and 10 inches, so is easily stored in your pannier, bar bag, or even attached to the frame of your bike. No more looking for something to lean your bike against, you can just flip out your click-stand and prop your bike up on it. The stand also comes with brake bands, which you keep on your handlebars and then slip over the brake lever when you stop, thus preventing the bike from moving whilst propped against the stand. The stand also comes in a choice of colours, so those who like to be colour coordinated can match the stand with their bike! We have been using these stands for well over 2 years now and are very impressed with their ease of use and their effectiveness. You can stand your bike up anywhere. If you happen to be on soggy or sandy ground, you can place the foot of the click-stand into a plastic cap (we got ours from plastic milk containers – see our earlier blog on the Helinox camping chair); this gives it a larger surface area and stops it from sinking. One point that I have thought of is, when using the click-stand in town with busy pedestrian traffic, it would be advisable to position the stand so that it and the bike are leaning towards, say, a wall and not out into the street where passersby could possibly trip over or kick the stand, causing the bike to fall over (never mind about the pedestrians!!!). Travelling as a couple, we always lean our bikes and stands in towards each other, if we have room to do so. …and here’s a link of what NOT to do with your click-stand!! 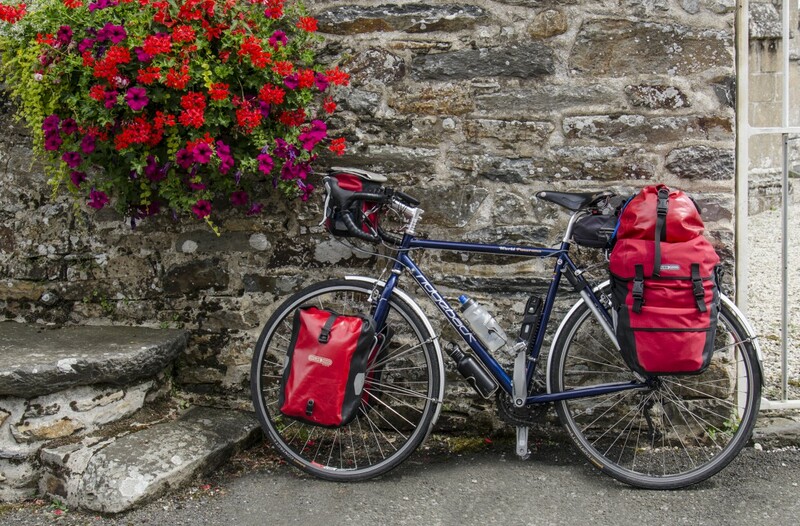 Categories: Bike, Camping, Cycle touring, cycling, Mike McEnnerney, photographer, Photography, PhotoLink Images, Tourism, Travel | Tags: Click-stand, Cycling, Ridgeback World Panorama bicycle | Permalink. A good review of an excellent product. I was telling a friend about your stand and he suggested a telescopic anglers rod rest as a cheap alternative – it can be velco strapped to your cross tube. Food for thought for us tight buggers! Sounds like a good idea. However, I’m not sure if it would work as each click-stand is made to order. You have to send in certain measurements of your bike when you place an order, as I think sizing is quite critical in order for the bike to balance properly. Might be worth giving the rod rest a try though in order to save a few hard-earned pennies!